Gage hauled in both of his targets, collecting 14 receiving yards during Sunday's 34-32 win against Tampa Bay. Gage caught two of four targets, collecting 33 receiving yards during Sunday's 40-14 win against the Cardinals. Gage reeled in his lone target for a gain of seven yards during Sunday's 26-16 loss to the Ravens. Gage caught his first career pass during Sunday's 34-29 win over Tampa Bay, a 9-yard gain. Analysis: Gage's grab off a quick pass helped set up a fourth-quarter touchdown run for Tevin Coleman. A knee injury kept the rookie out of the lineup earlier this season, and with Atlanta's depth at receiver, it seems unlikely that he'll get many opportunities to contribute. Even if he was given more chances, Monday's matchup with the Giants' 12th-ranked pass defense figures to offer challenges. 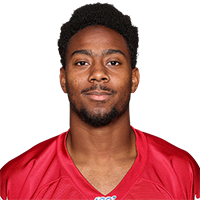 Gage (knee) was a full participant in Friday's practice and will play Sunday against the Saints, D. Orlando Ledbetter of The Atlanta Journal-Constitution reports. Analysis: Gage played Week 1 against Philly but recorded just one defensive snap while playing 19 on special teams. He should log a similar role in Week 3. Gage (knee) has been ruled out against the Panthers on Sunday, Vaughn McClure of ESPN.com reports. Analysis: Gage's absence in Week 2 comes as no surprise, given that the rookie sixth-round pick has not yet participated in practice this week. The deepest receiver on Atlanta's depth chart, Gage was a long shot to take offensive snaps even if healthy. When in uniform, Gage should primarily play on special teams. Gage didn't participate in practice Wednesday due to a knee injury, D. Orlando Ledbetter of The Atlanta Journal-Constitution reports. Analysis: The rookie sixth-round pick slots in at the bottom of the Falcons' depth chart at receiver, so he won't be in store for meaningful snaps on offense even if the injury is no longer a concern heading into Sunday's game against the Panthers. Gage (hamstring) returned as a full participant for the start of Falcons minicamp Tuesday, D. Orlando Ledbetter of The Atlanta Journal-Constitution reports. Analysis: Gage was pulled from Falcons OTAs last week after tweaking a muscle, but as head coach Dan Quinn expected, the rookie quickly recovered and is now partaking in practice with the rest of the active roster. Entering the league as a sixth-round draft pick, the versatile Gage will be competing for a spot on specials teams coverage, with an outside shot of earning the No. 4 receiver spot if he can outperform incumbent Justin Hardy in camp. 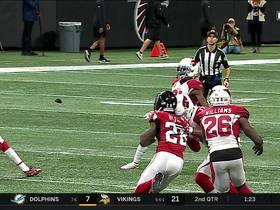 The Atlanta Falcons punt bounces off of the Atlanta Falcons wide receiver Russell Gage helmet for an unusual ricochet play against the Arizona Cardinals.